Attention, poor and unwashed: click the “X” at the upper right of this window immediately. Inside: tuna sammich, a juice box, and a wad of money. Now that we’ve gotten THOSE kind of people out of here, have we got news for you! 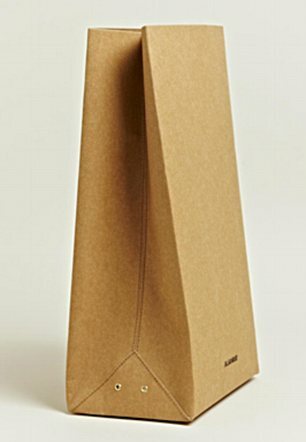 Fashion designer Jil Sander has debuted the must-have accessory for fall: a gorgeous brown paper bag. At just $290, no fan of fashion would be caught dead carrying their tuna sammich in anything else. This entry was posted on August 28, 2012 at 8:00 am and is filed under General Interest. You can follow any responses to this entry through the RSS 2.0 feed. You can leave a response, or trackback from your own site.